Tonkotsu, of course, is the intensely rich broth made from steeping pork bones for many hours, and many of the ramen cognoscenti consider this the king of soups. Finer renditions of tonkotsu verge on creaminess, and its deep savory flavors (and liquid fattiness) are both figuratively and possibly literally heart-stopping. But Ichiran, which has dozens of location throughout Japan, Taiwan, and Hong Kong, is actually known for something else besides its popular restaurants: In Asia, the company sells boxes of its instant ramen that many consider the finest of the packet genre extant. It fetches a rather high price—in Hong Kong, where I purchased a box, five packs of instant ramen came out to $25. One could also procure Ichiran instant ramen in the States if you’re willing to shell out enough clams—on Amazon, that same box of five costs $42, or about $8 a packet. (eBay has it for around the same price.) When our standard for instant ramen is 39 cents at the 7-Eleven, $8 seems like an exorbitant price. But our growing perception of ramen as no longer cheap dorm fare—as an art form, really—allows for some benefit of the doubt. So is it worth $8 a packet? 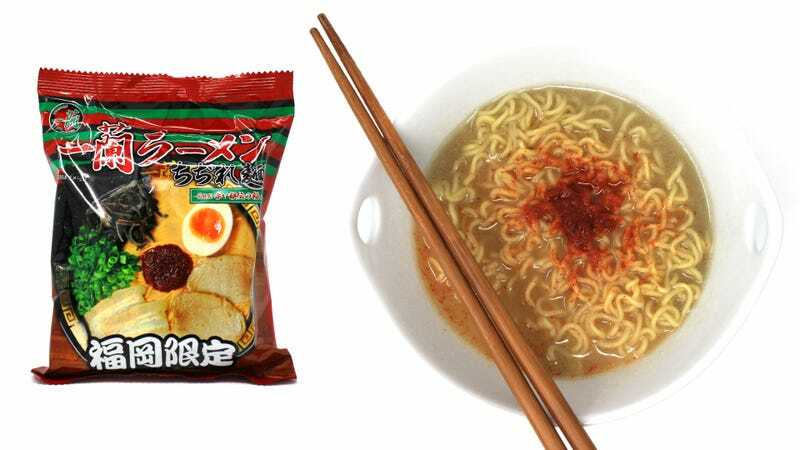 The package arrived with the standard deep-fried brick of noodles, a soup seasoning packet (1), a white goo it labels “special oil” (2) and packet of red chili powder. Not surprisingly, the cooking instructions provided were explicit—five settings of noodle firmness are laid out with precise boiling times. I prefer mine on the al dente side of firm, so after my 500 ml of water reached a boil, the ramen was ready in 2 minutes 30 seconds. I opted for only half of the red chili powder provided. Reset your expectations about what an $18 slaved-over bowl of ramen at a Brooklyn restaurant might taste like. Recalibrate to the fact that lunch was served in under five minutes, made in your underwear. In this mindset, the soup is extraordinary in that dried seasoning powder and hot water did not produce a salt-laden, chemically, artificial-tasting broth. 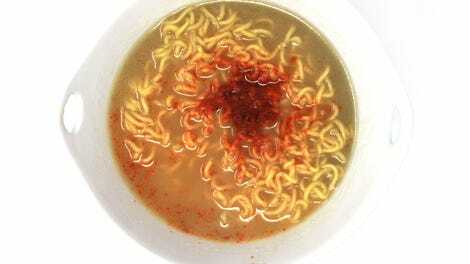 Ramen broth is supposed to be just one notch above salty, and here I was impressed by its rounded and non-bombastic pork flavors, punctuated with a sharp chili-peppered finish. It left a slickness around the lips, as tonkotsu should, and the curly noodles (as opposed to the Hakata-style of straight thin noodles) aided in the illusion of the broth better clung to noodles. The soup was warming and pleasant, savory with a tinge of sweetness, and one can’t help but finish every last drop of the broth. For packet ramen, you could fool quite a few unsuspecting people with this—add a molten egg, a few pieces of fatty pork chashu, some scallions—and the resulting bowl may pass muster of even the most discerning ramen nerd. They won’t think it’s Ippudo-level tonkotsu, but for a home cook it’d be an impressive showing. Ichiran’s instant ramen is unquestionably delicious, but the question is whether it’s worth paying $42 for a box of five. The novelty of a home ramen that’s leagues above Maruchan but one level below a ramen-ya is intriguing to keep in your cupboard. For curious seekers, it may be worth splitting the cost amongst five friends, and chalking it up to a life experience—just to say you paid the most you ever did for a pack of instant noodles.